Futur.e.s in Paris festival hosted an NGI/NEM event organized by Cap Digital and supported by the Vital Media project. The purpose of this event was to address different points raised by the NGI initiative while keeping in mind the various perspectives of the Futur.e.s festival. After a short introduction by Manuella Portier about Cap Digital, Futur.e.s in Paris and the agenda, Jean-Dominique Meunier presented the NEM Initiative and expressed a strong interest in NGI on the behalf of the NEM community. During this meeting, Olivier Bringer, Deputy and Acting Head of Unit, Next Generation Internet, European Commission took the floor to present the NGI flagship initiative by focusing on the key of NGI in order to involve internet innovators. He emphasized that at the beginning of 2019, Open Calls will be dedicated to internet innovators. He briefly underlined that NGI calls also support cross-continental actions as such the call ICT-31: EU-US Collaboration. During the debate different visions were put forward: the entrepreneur, the technologist, the lawyer and the European Commission all had their word to say. Through 4 key topics, the speakers discussed: governance, cross-border Internet, business models and education, culture and citizens’ awareness. This gave a full picture of the different issues that Open data raises and how the NGI initiative handles it. To know more about the debate, access the report here. 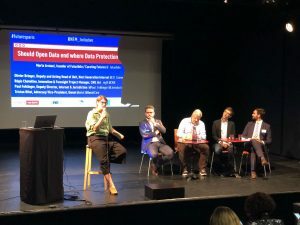 After the debate, Rehana Schwinninger-Ladak, Head of the Unit “Data Applications and Creativity”, DG Connect, European Commission explained to the audience the daily issues its Unit has to deal with as such the conservatism and insists on NGI approach as human-centric vision. To make it more tangible, she raised the questions that she has to handle with her work: “how to embrace school in the digitalization?” “How do you recombine technologies with protection and empowerment?” She continued by describing the challenge, the objective, and the expectations of each call: ICT-25-2018-2020 and ICT-30-2019. To conclude the meeting, Monique Calisti, CEO Martel Innovate, HUB4NGI Coordinator, emphasized that NGI Initiative has created a community and tools for the community to access in an effective way. Briefly, she described the various NGI initiatives : NGI Map, consultation on NGI, excellence in NGI, the upcoming Open calls funded by ICT-24 NGI OPEN INTERNET CALLS. Finally, she invited the audience to join the NGI community by participating in the next NGI forum on 13th September 2018 in Porto. Jean-Dominique Meunier’s full presentation here. Olivier Bringer’s full presentation available here. Rehana Schwinninger-Ladak’s full presentation available here. Monique Calisti’s full presentation available here.